Gerald “Jerry” Mellman, who took sports pictures for the Intermountain Jewish News for decades, died Aug. 6, 2018 at 91. He was taking photos as recently as a month ago. Printed below are tributes from the IJN staff and executives of the Denver Broncos, Colorado Rockies and Colorado Avalanche, along with some of Jerry’s favorite photographs. I met Jerry when I joined the newspaper 26 years ago. Due to my aversion to sports, we never traded Rockies or Broncos stats. But he always complimented me: “You’re a great writer, kid.” Jerry was sweet that way. Jerry loved his job. In each prayer he wrote for our Rosh Hashanah edition, he thanked the IJN for giving him the opportunity to do what he loved most. Jerry was too humble to praise himself. He always turned the camera on everyone else. He took our photographs during countless birthday lunches, capturing smiles, hungry mouths, new hair colors, thinning hair. Year after year Jerry chronicled our lives but omitted his own face from the photos. Perhaps that’s why I see him so clearly in my heart today — ageless; undimmed by time. Gerald Mellman’s passing leaves a gaping hole at the IJN. He was the longest serving member of the staff and in fact his association with the newspaper even predated my grandparents, Max and Miriam Goldberg, back in 1943. How do you go from hearing someone’s voice every week to accepting that he is gone? I’ve spoken to Jerry at least once a week for the past three-and-a-half years. Most often he called about his pictures, but he also called just to chat or check in. Like me, Jerry always wondered if so-and-so — for example, an athlete or politician — was Jewish. If I didn’t know the answer straightaway, I would do some research and get back to him. He had a strong sense of communal Jewish pride and experienced vicarious pleasure when a Jewish person made it in his or her chosen field. Jerry was also an adept negotiator. A lawyer by profession, he knew how to argue his case. Sometimes a picture might not be apt for a particular week. Jerry and I would go back and forth; he’d often make the same request but in a slightly different way until he’d convinced me. That said, Jerry was always very respectful toward me, which I greatly appreciated. After all, I’m much younger than he — by decades! — and he didn’t have to take me seriously. But Jerry not only accepted me, he was very complimentary of my work. Sometimes I’d ask my colleague Seiji Nagata which sport he thought was Jerry’s favorite. The answer: He just loves all sports. How true. He kept up with all the players, all the stats, across all the major professional sports. Shortly after his 90th birthday, I had a flash: The perfect gift for Jerry would be a gold NFL Hall of Fame jacket. If ever there was a Hall of Famer, it was Jerry Mellman. We may not have given him a jacket, but Jerry was a life member of the IJN’s Hall of Fame. To me, the most striking aspect of Jerry Mellman — and the main component of my decades-long friendship with him — was his amazing love of sports. 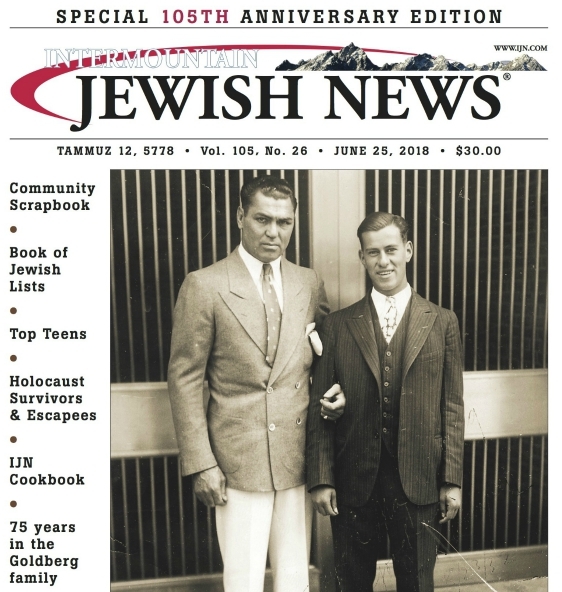 Once, while leafing through a bound volume of the Intermountain Jewish News from the late 1930s, I came across a small article about a high school sports event carrying the byline “Gerald Mellman.” He couldn’t have been more than a kid at the time. That informed me that Jerry’s tenure at the paper was much older than that of any of the current staff and even the generation before that. It also told me that Jerry’s love of sports went way, way back, most likely to his early childhood. Jerry never had much to say about his day job as a lawyer, so I never knew how he really felt about that. He said a great deal about sports, however, and his feelings about that were very clear. Nothing pleased him more than to be standing on the sidelines, by courtside or behind the dugout as professional athletes did their thing a few feet away, as the crowd roared, as the whole unique ambience of a big sporting event unfolded around him. With his camera slung from his neck and his eye always on the action, Jerry, I believe, achieved a certain level of nirvana at those moments. Once — I think it was during a Nuggets game — he actually became part of the action. One of the players stumbled off the court and plunged into the group of photographers gathered there. Jerry took a hard fall, earned a few bruises, may even have had to visit the doctor, but he was far from deterred. I believe he wore the incident as a badge of honor for the rest of his life. Only seldom did I cover sports stories, but on those occasions when I did, Jerry was unfailingly the photographer chosen for the task. Together, we photographed or spoke to some of the true greats of Denver and national sports — Lyle Alzado, Sonny Jurgenson, John Elway, Muhammad Ali, Eric Young, Andrés Galarraga. He was a wonderful person to share those moments with. Jerry was a quiet and modest man who never seemed to want to attract attention to himself. He was also warm and approachable, genuine and affectionate, considerate and kind. His family and his IJN colleagues weren’t the only ones who knew that. More than once, in speaking to media representatives of the Broncos, Rockies or Nuggets, I was told how much they liked Jerry, how much respect they had for him, how good his photographs were, what a nice guy, a “genuine mensch” he was. I am so sorry. Good man. Again our sympathy. We think it’s amazing and touching his services are on a Rockies day game [Wednesday, Aug. 8] since he always loved coming here when we had a daytime game. Since Jerry was all about sports — and me, not so much —I can only address his impressive character: low key, kind, gentle, caring and thoughtful. Jerry was easy to like. Inever heard a bad word about anyone from him. He embodied the traits of sportsmanship and being sportsmanly as defined by Webster’s dictionary: A person who is fair, generous, a good loser and gracious winner. Jerry was greatly respected and beloved at the Jewish News and will be sorely missed. We are so sorry to hear the news. I very much enjoyed getting to know Jerry over the years. He will be missed. I’m so sorry to hear the news about Jerry. I got to know him so well when I worked in PR. He is now resting in peace. Prayers to all of his personal and professional family. How I enjoyed Jerry Mellman’s weekly visits to the IJN office to deliver his action shots of the Broncos, Nuggets, Avs or Rockies. But I think he enjoyed those visits even more. He made the rounds of the office saying hello to everyone. I would look up from my desk to say hello, and he’d snap a photo of me. That was his way of expressing friendship. We were Jerry’s second family, and he made a point to tell us that every year during his office birthday party. He would stand up and give an eloquent speech, expressing his affinity for the IJN and its staff. I could tell by his extemporaneous oratorical skills that he must have been an effective trial lawyer during his long career. I was always amazed how — when he was well into his 80s — he’d be sitting on the floor, courtside at the Nuggets’ games, ready to capture those middle-of-the-air shots. I already miss this gentleman — truly a gentle man — and his love of sports. Jerry took such pride in his sports and photos. He followed up each press day to make sure everything was right. He enjoyed talking sports with everyone and was so knowledgeable and passionate. Jerry was strong, intelligent, giving, thoughtful and respected by all. He loved coming to our birthday parties and taking pictures (he always had his camera). He said the only problem was that I didn’t like my picture taken and he never gave up trying to get one. What a gentle soul. He will be sadly missed along with his sports photos. Very sad. He was a great person. Jerry practiced law for many years. That is one tough business. Yet Jerry remained gentle all of those years. For the last 40 years of his life he added another job or hobby to his portfolio: a sports photojournalist. Jerry sat courtside with the roughest professional basketball players in the world, yet he remained gentle. He sat on the field at NFL games and witnessed serious violence on game day, yet Jerry remained gentle. For 70 years, Jerry, along with his wife Gen, was extremely passionate about Israel. He would discuss the wars, the terrorists, the suicide bombers and all of the violence taking place in Israel, but throughout it all Jerry would always remain gentle. Jerry was proud of his Jewish heritage. He loved life and he loved giving to others. Jerry was my mentor. He took me under his wing when I was a young, vulnerable kid who had just moved half way across the globe from Israel to Denver. He found out that I enjoyed sports and photography and he asked me if I would like to come take pictures with him courtside at an NBA game. (This was before advertisers took up the space on courtside and the photojournalists were actually allowed to sit there.) Would I like to? It was a dream for a young child. Jerry would develop my pictures in his dark room and come by the next day. There is one picture that Jerry never took and I regret it to this day. During halftime of the NBA games Jerry would go to the press room which was right next to the players’ locker room. I was with Jerry one night during the 1980’s at the old McNichols sports arena during half time. We were leaving the press room and returning to the court when suddenly a side door opened and who should come out but Manute Bol. For those who don’t remember, Bol, the tallest player in the NBA in the 1980’s, was a mere seven feet and seven inches. I was close to six feet at the time and I only reached Bols’ waist. By the time Jerry took his camera out and was ready to shoot, Bol was gone. Jerry loved his family and was very proud of them. He treated his wife with tremendous respect and gentleness. Jerry loved his work for the IJN. He loved his second family, the family of the IJN. Even in his younger years, before he retired from his “real” job as a lawyer, he always made it a point to attend all of the birthday parties for the IJN employees; a tradition that my grandmother, Miriam Goldberg, the late editor and publisher of the IJN instituted many years ago. I cannot be sure, but I want to think that Jerry made the NBA, NFL, NHL and MLB players he met better people. Jerry got to see the greatest sports players on the planet up close on a daily basis and these players got to see Jerry up close very often. Players like John Elway, Tom Jackson, Alex English, Fat Lever, Joe Sakic, Peter Forsberg, Andres Galaraga, and Larry Walker, to name a few of the local stars. The way he behaved on the court and on the field, his especially gentle and respectful manner, was rare for any human being, and specifically for a photojournalist in the sports business, one of the toughest businesses around. Jerry was a mensch. He lived a life of kiddush Hashem, sanctifying the name of G-d. Wherever he went he gave a good name to the Jewish people. Jerry was an incredibly person and he will be missed. I met Jerry over 14 years ago. He became a regular at the Costco photo lab. I enjoyed my conversations with him everytime he came in. Always willing to take our picture. Now I will treasure them even more. Will be greatly missed by all of us at the store. I was fortunate enough to photograph alongside Jerry at various sports venues in the early nineties. We became friends and I always looked forward to seeing him and his fine photography in the IJN. He was a man I won’t soon forget.